Film has the unique gift of giving its viewers the chance to better understand the lives of people from around the world and widening their perspectives. Having just returned from her work placement at Hanoi's DOCLAB, our FEDS alumna Umulkhayr Mohamed writes about her experience and what film programmers can do to help rectify today's cultural blind spots. When the average cinema goer attends around three times a year, how do you ensure one of those cinema trips is to catch a documentary? Sheffield Doc/Fest's Marketing Assistant (and one of our FEDS trainees) Aisha Jan writes how we can create buzz around these cinematic pieces of factual storytelling - and how they are as much real films as the fictional ones. A career in film was something that for much of her life Chapter Arts Centre's Anim18 Project Coordinator (and our FEDS trainee) Umulkhayr Mohamed thought wasn't within reach for her. Ahead of our upcoming I.D. (Inclusion & Diversity) Screening Day, read her thoughts on what we should be doing to try and finally overcome this. Scotland may be notorious for erratic weather but GFT's Programme Assistant Chris Kumar thought he had seen it all. He was proven wrong this past February when Glasgow Film Festival was paid a visit by one of the harshest cold waves in years, the Beast from the East. Short films are a unique and powerful art form, so why do we not give them more space in film culture? Roisin Mullins, one of our FEDS trainees, working at Aesthetica Short Film Festival in York, tells us why shorts are much more than a stepping stone and deserve to have a place in your cinema. We're currently looking for the next generation of talent on our FEDS scheme, which offers eight months of paid training with a major film festival or cinema. But what's it like being a FED? Here, one of our current trainees Allen Loyola tells us about his role at Queen's Film Theatre in Belfast. We spoke to Maria Cabrera, one of the most recent cohort of FEDS trainees, about her experiences at the Barbican during her traineeship and what she's learnt about the best ways to collaborate to create meaningful film experiences and reach out to new audiences. This week we caught up with Anthony Gartland, one of this year's FEDS trainees, to see what he's been up to during his traineeship at LUX Artist Moving Image. Diversity on screen: what does that really mean? 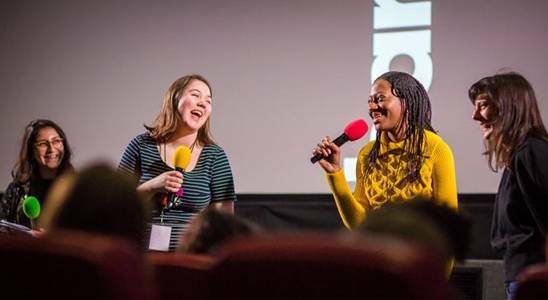 We asked Mikaela Smith, one of this year's FEDS trainees, about how her host organisation Showroom Cinema is thinking about diversity in their programme and how they are trying to improve representation on their screens. We caught up with Rico Johnson-Sinclair, one of the trainees currently taking part in our FEDS scheme, to mine him for tips for surviving a film festival. Less than a month into his placement, Flatpack Film Festival kicked off. Here's what he learned from his baptism of fire.